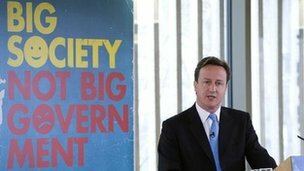 Today, Cameron’s flagship policy, the big society, has suffered a serious blow; a leading charity figure has described it as being “effectively dead”. Sir Stephen Bubb, head of the Association of Chief Executives of Voluntary Organisations, damned the big society agenda as a result of spending cuts in charity funding and reforms. Cameron’s rhetoric of the big society attracted much criticism to begin with, but has now become a byword for a shift of public services into the hands of charities and the voluntary sector. However, it is not the idea of the big society that is being attacked, rather the execution of it. Sir Stephen spoke on the Today programme of how he supported the concept of the big society, but that this vision is struggling to come to fruition. He argues that the government are not enacting their ideas about reforming public services and the big society cannot progress. Bubb’s accusation of progress being “glacially slow” has, of course, been rejected by the government, who argue that the coalition has done a lot to help charities through the cutting of red tape and bureaucracy. Despite these claims, charities have pushed for further help and commitments from the government today, in their mid-term review. This new level of criticism is potentially more damaging for Cameron, especially in the light of today’s ‘mid-term report’ for the coalition and his wish to remain prime minister until at least 2020, due to it damaging his credibility as a professional politician, as opposed to just an ideological critique. Not at all, they’re being paid are they not? Plenty of cash for that, no doubt!